Take a look at 37 Valentine's Day gift ideas that you can make yourself for your special someone. This includes everything from cake toppers to candy grams—perfect for gifting to your friends or your sweetheart. There are also Valentine's Day DIY ideas for kids to consider, too. Surprise your special someone with a gift of a bottle of their favorite hot sauce wrapped with a printable black and white label that says "Hot Stuff" from Delia Creates. Beautifully wrap fresh flowers for your Valentine with these modern Valentine's Day printable flower wraps from A Bubble Life. Make your home feel more romantic all year round by framing a "You Are My Everything" print that you can print at home for free from C.R.A.F.T. Make everyone smile in the office this Valentine's Day by bringing in cupcakes for the office with DIY pop culture song cupcake toppers that have relationship wisdom from popular songs. This concept was developed by ​Sugar And Cloth. Forgot to buy a card for your Valentine? Skip the mad dash to the store to find a card and print one of these four chic gold foil cards to give this Valentine's Day from Yellow Bliss Road. Grab a copy of this classic, hand-lettered Valentine's Day card from The Sweetest Occasion that you can make by printing the template on a sheet of white card stock. Add some seasonal romantic decor to decorate your home for Valentine's day by printing a copy of the love script artwork which is available in silver glitter or gold foil that you can print for free at home. The idea was developed by A Night Owl. Tired of the typical, cheesy romantic Valentine's Day card options that you find in the card store? If so, these funny DIY 90s rap cards from Almost Makes Perfect include lyrics from the songs "Miss Jackson," "Shoop," "I Like Big Butts," and "Rumpshaker." These just might be the perfect card for you to send your sweetheart. Add this modern typography print that says love is in the air to your bedroom just in time for Valentine's Day from Liz On Call. Make your family smile this Valentine's Day by serving everyone drinks with cute conversation heart straws that you can make by printing the template and slipping the design over standard- sized straws from Craftaholics Anonymous. Surprise someone this Valentine's Day with some chocolate by decorating a regular candy bar with a printable wrapper with a sweet Valentine's Day message from Lil'Luna. Create your own grouping of conversation heart art by printing the 5-inch by 7-inch and 8-inch by 10-inch candy prints to decorate your walls this February from I Heart Naptime. If you forgot to buy special candy bags for your kids to bring into school for all their classmates, then fear not. You can quickly make beautiful Valentine's Day treat bags by decorating plain plastic food bags with a printable bag topper from Makoodle. Craft your own custom "I Love You More Than" artwork from Sarah Hearts where you write down what you love them more than for a cute Valentine's Day gift. Instead of the typical gifts of chocolates or flowers, this Valentine's Day give the gift of your time by making a booklet of romantic coupons from I Heart Naptime that your spouse can cash in for various things like breakfast in bed or a massage. If you want to make the box of inexpensive chocolates you bought your valentine look extra fancy, give the box cover a makeover with the help of this free printable from Studio DIY. Surprise your Valentine with one of these funny printable cards from Sugar And Cloth on February 14th. Go retro this Valentine's Day by surprising your friends with these fun 80s-inspired printable Valentines just like you used to hand out in school. The idea was developed by Damask Love. Keep your kids entertained on Valentine's Day with this festive coloring page from Tried And True that they can color with crayons or markers. Decorate your house with this sweetheart print from ​The Sweetest Occasion to add some romantic decor to your house year round. This stunning cake originally developed by Sugar And Cloth is surprisingly not too difficult to make​ and will leave everyone dazzled on Valentine's Day because the heart marquee has real working LED lights. Hand out bars of chocolate this Valentine's Day by wrapping them up with a festive, printable watercolor wrapper by Lia Griffith. Put a smile on someone's face by leaving them a delicious cupcake topped with a DIY pompom heart from The Sweetest Occasion. Add this "Life Is Sweet" chocolate truffle wreath to your home as a fun way to decorate for Valentine's Day this year. It is sure to encourage your chocolate cravings to jump into hyperdrive. The idea comes from Live Craft Love. 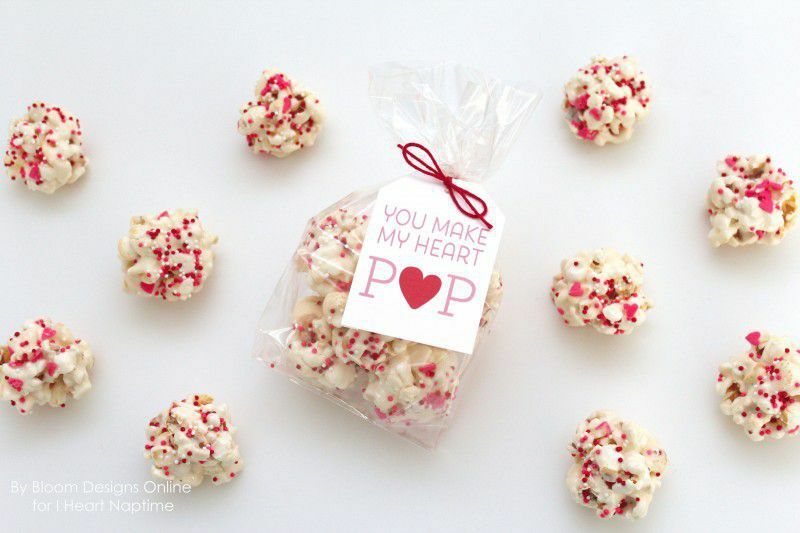 Surprise your family or friends with a cup of delicious chocolate marshmallow popcorn balls for a sweet and salty treat this Valentine's Day that you can package in a plastic cup decorated with a printable "My Heart Pops for You" gift tag from I Heart Naptime. Whip up a more sophisticated batch of candy hearts by baking a batch of macaroons that are made to look like candy hearts complete with cute gold messages. The idea is from Sugar And Cloth. Enhance any regular homemade or store-bought dessert such as a pie or cake by adding this simple to make cake topper this Valentine's Day from Stephanie White. Surprise someone this Valentine's Day with a box of your homemade chocolate desserts such as truffles or cookies in this gorgeous DIY box from Design Eat Repeat. Make your own cupid arrows to stick into the desserts you will be bringing into the office this year. The dessert topper idea comes from The Sweetest Occasion. Here is another idea for candy treat bags for your children to bring with them to school to give to their classmates. Pack some candy such as candy hearts in a plastic bag, add a cute printable topper, and make candy grams ala Freutcake for all the kids. Surprise your husband or wife this Valentine's Day with breakfast in bed by serving a sweet stack of pancakes topped with a DIY sparkle heart topper from The Sweetest Occasion that can be made in under a minute using a pipe cleaner. Make your own sweet candy heart leggings to wear this Valentine's Day. The idea comes from Studio DIY. Make this "I Donut Know What I Would Do Without You" card for your sweetheart this Valentine's Day, which was originally designed by Damask Love. Instead of traditional chocolates, package up individual-sized pies with this free printable sweet as pie wrapper from Living Locurto. Put some of those extra mason jars in your kitchen to good use by filling them with chocolate kisses in this quick Valentine's Day gift idea from A Night Owl. Use your Silhouette or Cricut Explore to make these color-blocked heart cake toppers from Sarah Hearts this Valentine's Day. You can make everything from the tattoos to the envelopes right in the comfort of your own home. Whether it's for a class party or a Galentine's get together, everyone will love these sweet little temporary tattoos.